Tancharoen at the San Diego Comic-Con International in July 2011. Kevin Harwick Tancharoen (born April 23, 1984) is an American film director, producer, screenwriter, dancer, and choreographer.. On September 29, 2011, New Line Cinema/Warner Bros. announced that Tancharoen would be helming a big-screen adaptation of Mortal Kombat after he created the successful web series Mortal Kombat: Legacy, although he dropped out of the project in 2013. Tancharoen was born in Los Angeles, California. 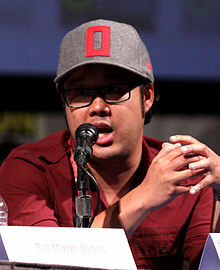 He is the brother of Maurissa Tancharoen (frequent collaborator and sister-in-law of Joss Whedon) and the son of Tommy Tancharoen. He is known for being a choreographer for Madonna, directing Britney Spears' "The Onyx Hotel Tour" and co-creating DanceLife on MTV. He made his feature film directorial debut in 2009 with the remake of the 1980 film Fame. In 2010, Tancharoen directed the short film Mortal Kombat: Rebirth as a proof of concept for his vision of a new Mortal Kombat feature. From that, he directed and produced the Mortal Kombat: Legacy web series. In 2011, Tancharoen directed Glee: The 3D Concert Movie, a 3D concert film of the Glee Live! In Concert! tour based on the musical TV series. On September 29, 2011, New Line Cinema/Warner Bros. announced that Kevin Tancharoen had signed on to direct a new big-screen adaptation of Mortal Kombat, but he backed out of the project in October 2013. In an interview, Tancharoen told Nerd Reactor that he is still planning to direct season 3 of Mortal Kombat: Legacy. ^ a b "According to the State of California. California Birth Index, 1905–1995. Center for Health Statistics, California Department of Health Services, Sacramento, California". Familytreelegends.com. Retrieved 2017-01-15. ^ a b Lesnick, Silas (2011-09-29). "New Line to Reboot Mortal Kombat !". ComingSoon.net. Retrieved 2017-01-15. ^ "Kevin Tancharoen Exclusive Interview – FAME". Collider.com. Retrieved 2009-08-28. ^ Miska, Brad (2010-06-09). "Here's the Skinny on that 'Mortal Kombat' Short Film!". Bloody Disgusting!. Retrieved 2017-01-15. ^ "'Mortal Kombat' Crime Short Could Go Feature Length". Comicsalliance.com. Archived from the original on 2012-03-05. Retrieved 2017-01-15. ^ Charles Webb (2010-06-08). "Meet The Face Of The New MORTAL KOMBAT!". Twitchfilm.net. Retrieved 2017-01-15. ^ McClintock, Pamela (May 4, 2011). "Fox to Release 3D 'Glee' Concert Film in Theaters". The Hollywood Reporter. Prometheus Global Media. Retrieved August 2, 2011. ^ "Kevin Tancharoen Departs Mortal Kombat". October 25, 2013. Retrieved 28 October 2013. ^ "The Gable 5 premieres, plus interview with director Kevin Tancharoen and the future of Mortal Kombat Legacy". Nerd Reactor. March 27, 2014. Archived from the original on March 29, 2014. Retrieved March 27, 2014. This page was last edited on 15 April 2019, at 06:01 (UTC).